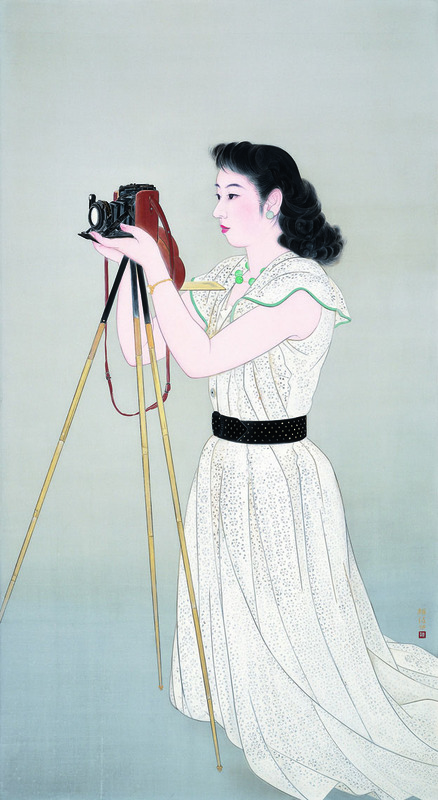 “Painted by Women: Elegance of Showa Period” announces a thematic concern of the time, 1926-89, on which the art world was rigidified. Japan had embarked upon a 15-year period of war (1931-1945) and the individual expressive liberties that had informed the Taisho Era (1912-26), were being reined in. It is difficult to say whether this was tantamount to artistic decline for many artists, but conservatism became the norm and the rupture that war occasioned defined their remaining careers. Hisako Kajiwara (1896-1988), for example, grew up under Taisho democracy as the daughter of an affluent sake brewer in Kyoto. She trained in nihonga (Japanese style painting) with eminent teachers such as Soun Chigusa and Keigetsu Kikuchi, making her artistic debut in 1918 in Kyoto’s Kokuga Society. A couple of years earlier, she had developed a radical alternative to the genre of bijinga (pictures of beautiful women). Rather than depicting the elegant doll-like figures characterizing the genre until then, Kajiwara represented women with dour faces, geisha who had lost their looks and women doing menial work. Much went unsold. 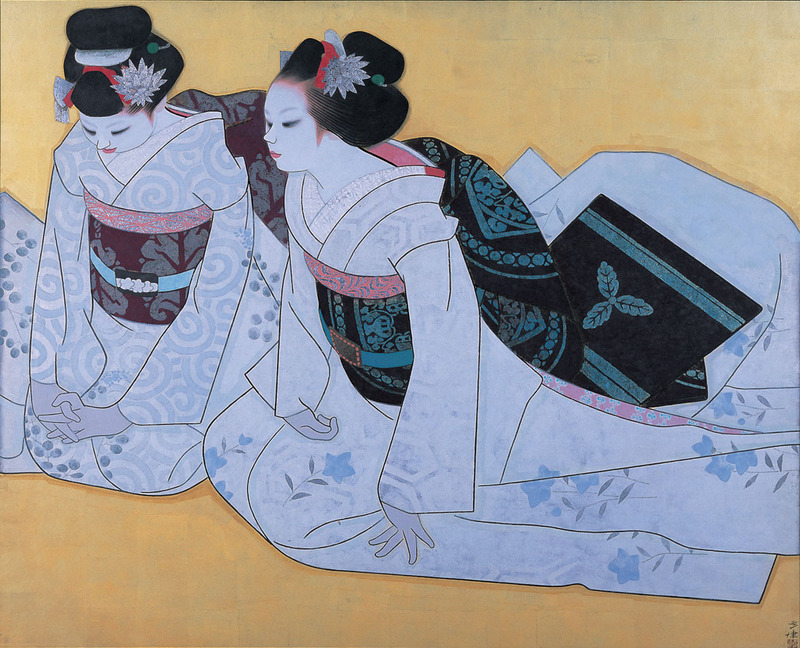 Her father was bankrupted in 1929 and the following year her oeuvre shifted to the portrayal of refined femininity such as “Koto Music” (1937), in which two expensively kimono-clad women take their music practice. Geisha were elegantly revived in postwar works such as “Maiko Autumn Style” (1955-65) in which trainee women-in-waiting are decked out in their seasonal fashions. Only at the very end of her career did Kajiwara return to something of the individualized, contemplative facial expressions that inhered in her early work, such as the pensively posed woman in a traditional Okinawan kimono who sits on a foreshore in “Cape of Zanpa” (1978). The other three nihonga painters in the exhibition are Tazu Hirota (1904-1990), Toshiko Mitani (1904-1992) and Eigetsu Kitagawa (1907-1989). Hirota was a breakaway student of the eminent teacher Suisho Nishiyama. Though she left with a number of Nishiyama’s other atelier students in 1948 to form the Creative Art Society in 1948, her subject matter largely concerned conventional feminine roles, such as “Mother and Child” (1945). She also created more reduced figurative scenes of womanhood under the mild influence of Western art’s reductive abstraction with a kind of printmaking aesthetic in flat colors and black contours. A later shift to portraying big-breasted, thick-thighed voluptuous nudes was her final career thematic. 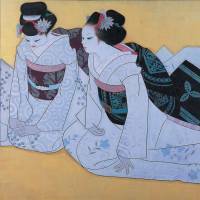 Mitani, who also learned painting under Nishiyama, focused exclusively on painting women. Her oeuvre is largely uninspiring, though her “Woman” (1958), in which her subject plays the shamisen, illustrates one way in which an attenuated geometrical abstraction of oval color forms could be combined with the conservative demands for elegant femininity. 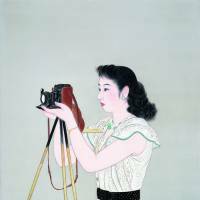 Kitazawa developed an ornamental, decorative realism, though her work, too, was largely confined to rather staid representations of womanhood. Humanistic individuality emerges, however, in “Yasue-san One Day” (1967), her portrayal of the actress Yamamoto Yasue. All of this reminds us of a curious characteristic of the formative Taisho Era nihonga painters — the youthful work is the best; that of their later careers, attenuation.